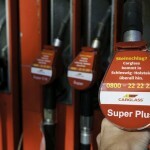 There were more than 2.4 million accidents in Germany in 2011. 4009 people lost their lives. It is this time of the year – when the days become shorter – that shows a significant increase in the risk of accidents. Rain, fog and even ice and snow cause bad visibility conditions. The Federal Ministry of Transport, Building and Urban Development (BMVBS) and the German Traffic Safety Association (DVR) have therefore started a campaign to remind drivers to do their best when it comes to maintaining clear visibility and functioning lights on their cars. 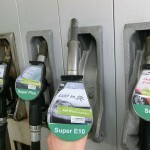 The campaign includes 900 petrol stations and aims at accident prevention. 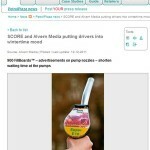 Ambient specialists Alvern Media created the FillBoards™ – pump nozzle ads – that feature slogans such as “Lights on!”, “All windows clear!” or “Frost-free lights!” in five select federal states for the entire month of December. 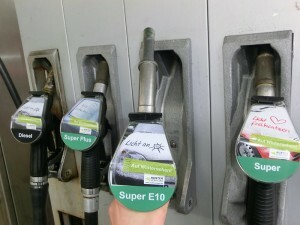 The Ambient campaign effectively supports the traffic safety campaign “Runter vom Gas” (“Foot off the gas!”) in their winter activities. Huge posters were installed on roadsides at the outskirts of several small and mid-sized cities in Bavaria, Saxony, Brandenburg, Lower-Saxony and North Rhine-Westphalia. The transregional motto used on the posters is the same that is being used on the pump nozzles: “Auf Wintersehen!” (a pun comprising the German “Auf Wiedersehen”/”See you soon” and the word “winter”). The motifs used try to relate the essential aspects of the importance of a clear view and good visibility in an insistent yet charming way. While filling their tanks, drivers come into direct contact with the advertising medium reminding them to always keep all of their car’s windows and lights clear of ice and snow. 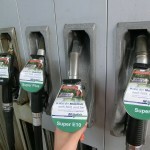 The FillBoard™ campaign is mainly focused on petrol stations in the vicinity of smaller main roads. Statistics show that these roads are especially hazardous. Poor visibility increases the risk significantly. About 66 percent of all accidents occur during winter in rural areas, for example on country roads and highways. Normally it is exactly the opposite: Approximately 66 percent of all accidents usually take place in small towns and villages.